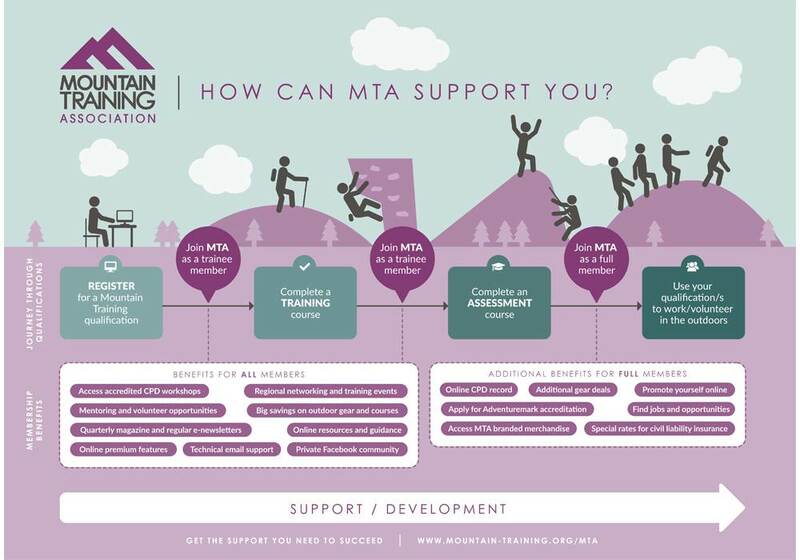 The Mountain Training Association is the support & development branch of Mountain Training, providing members with extra support and CPD opportunities. It was created in 2005 to support people working towards their qualifications and develop people who already have them. Now well established with over 5,500 members it is the nationally recognised membership organisation for climbing, walking and mountain leaders in the UK and Ireland. Whether you're planning to attend a training course, have got your assessment coming up, already work/volunteer in the outdoor industry, or just want to stay informed, in touch and up to date, the Mountain Training Association has something for you; supporting you through your qualification journey and for the rest of your outdoor career. Membership of the association is not compulsory and you need to be registered on a Mountain Training award scheme before you can join. The Mountain Training Association’s overarching aim is to provide support and development opportunities to enable our members to excel. We are committed to fostering progression and encouraging good practice so that others can enjoy professionally-led activities. Our vision is to continue leading the way in this field and to widen recognition from within the outdoor industry. Promote good practice and professionalism. Lead the way in providing quality personal development opportunities. Develop a growing supply of valuable resources. Provide a hub for communication and networking. Provide regionally focused communities of support. Build mutually beneficial links with other outdoor organisations. Provide a structure for members to contribute to Mountain Training. As soon as you join, you will be able to take advantage of a whole host of association benefits. Update, refresh and broaden your skills by attending UK-wide accredited CPD workshops and training events, find walking and climbing partners and gain access to a wide range of special gear deals, trade discounts, exclusively discounted insurance and special association publications. The association also provides a link between you the candidate and Mountain Training beyond obtaining an qualification and for the rest of your career so you can stay up to date with the latest developments regarding qualifications and the industry as a whole. The Mountain Training Association provides continued support and development opportunities for Mountain Training candidates who have registered for an award scheme. Members are either working towards a Mountain Training award or already hold qualifications and are actively working in the outdoors, so when you join you can be at any stage in your qualification journey; just registered, completed a training course or using your award/s for outdoor work. Members come from a wide variety of backgrounds; some work full time in the outdoors as freelance professionals or run their own business, others work in full time education, outdoor centres or climbing walls as managers or staff. Many are involved in DofE and volunteer with schools, Girl Guides and Scouts and some seek the qualifications for personal competence. Members are either working towards a Mountain Training award (trainee members) or already hold qualifications and are actively working in the outdoors (full members). Full members of the Mountain Training Association hold one or more of Mountain Trainings' nationally recognised qualifications having completed training, consolidation and assessment. They are passionate about the activities they provide and are committed to continued personal development (CPD) demonstrating the benefits of ongoing experience and enhanced skills, so not only are they qualified, they also have the support to stay up to date with good practice. If you can answer YES to any of the following questions then you are eligible to join the Mountain Training Association and begin enjoying the many benefits that come with membership. Just registered for a Mountain Training award? Completed a training course for one of the Mountain Training award schemes? Passed an assessment and hold a Mountain Training qualification? Used your Mountain Training qualification for work or in a volunteer capacity? Completed an award and you're now keen to undertake a new one? Many higher award holders also choose to join the Mountain Training Association in addition to being members of the Association of Mountaineering Instructors (AMI), British Association of International Mountain Leaders (BAIML) and/or British Mountain Guides (BMG). We hope candidates who register for the Hill & Mountain skills scheme will in the future choose to undergo an award scheme, at which point they will become eligible to join the Mountain Training Association. Membership is only £36 per year (that's only £3 a month!) and to save you the hassle of logging into your Mountain Training account and paying your membership manually each year you now have the option to renew your membership by direct debit. What happens once I've joined? As soon as you have paid for your MTA membership online you will have instant access to the Members Area containing useful resources, digital copies of past magazine editions and gear deal information. You will also be able to record CPD in your online Mountain Training account and make your CMS profile public if you wish. Depending upon the stage you at with your Mountain Training qualifications, you will either join as a Trainee member (you have registered or completed a training course) or a Full member (you have already completed atleast one Mountain Training qualification.) Your membership type/status will appear in your online account and on your membership card. You will receive your MTA membership card in the post shortly after joining. Please double check your postal address in your online Mountain Training account and ensure that it is up to date.